The early sowing of wheat has possibly lost favour and indeed is frowned upon by many growers and agronomists who have moved away from this concept due to ever increasing blackgrass levels on farm. 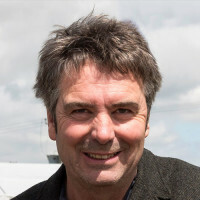 Nevertheless, growers without blackgrass problems still have the opportunity to , and can continue to benefit from, drilling crops early, says Ron Granger, technical arable manager for seed breeders Limagrain UK. Early drilling however does have significant risks recognises Mr Granger, and is a major test for both grower and variety both in terms of crop management and variety suitability. Most commercial varieties currently available are products of breeding programmes and varietal testing that is targeted at traditional sowing dates in October. 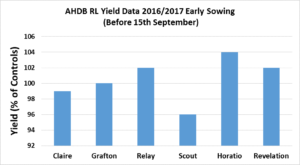 Although the AHDB does produce data on earlier sowing dates, this is quite limited, he points out. In order for a variety to be deemed suitable for the earlier drilling slot, it should ideally have a number of key agronomic characteristics, highlights Mr Granger. Early sowing does tend to produce plants with a greater biomass, due to increased stem length and extra tillers per plant which in turn increases lodging pressure. Mr Granger advises a good split PGR programme at the key crop development phases of stem elongation. A prostrate winter habit is essential to prevent the crop becoming too erect and over proud through the winter which can produce plant loss from winter kill or frost damage to the growing point in the early spring. High tillering ability is necessary as seeding rates are reduced significantly at sowing time – winter wheat plants are very adaptable and plants sown early with a high tillering capacity will produce many tillers. Historically varieties for the ‘very early drilling’ scenario required a very slow apical growth in the early spring, but we have learnt that actually varieties that sit with a prostrate habit in the winter, with a faster development in the spring do perform in this situation if the variety has good ear fertility. Good disease resistance should be considered of high importance for the earlier drilling concept – earlier drilling leads to more nitrogen being taken up in the autumn leading to lusher growth and a consequent greater risk of foliar disease. Root and stem disease, noticeably eyespot, is considerably greater even in a first wheat situation and eyespot resistant varieties and a good seed treatment for control should be considered. The fungicide programme for earlier drilled wheats will certainly have to be adjusted to take into account both the possibility of greater disease pressure. More importantly timings of application must be considered, as earlier drilled crops will certainly move quicker through the growth stages compared to crops drilled later at the more traditional sowing dates. The ear fertility of the variety in the earlier drilled scenario is certainly a significant attribute for full yield potential. This is regarded of high importance and Limagrain test varieties to the extreme to tease out the differences to ensure varieties will perform in this situation. Determining variety differences for ear sterility is not easy and collating of data over regions and seasons is essential in ever changing environments. Varieties with good specific weights should be considered for the earlier drilling period. High ear numbers from early sowings can reduce specific weights so it’s important to ensure that thick crop canopies are managed by either delayed nitrogen timings or good PGR programmes to establish targeted ear numbers for optimal yield. Although early drilling does not guarantee additional yield performance it’s important that the variety fits the criteria and does well on farm both in terms of yield and agronomic type. Revelation appears to be performing well in the early drilled situation both in trials and more importantly on farm. The variety has become a large commercial variety based on the security it offers growers regarding its agronomic characteristics and the impressive results it gave in the high disease pressure seasons of 2012 and 2014. Revelation has good straw strength and has a very good disease resistance profile – one of the best on the present AHDB recommended list. It has very good rust and Septoria tritici resistance and the real ‘bonus’ of eyespot resistance based on the Pch1 gene from Rendezvous. The variety has a slow primordial development and would appear to be lower tillering with a more pronounced upright habit in the spring. Revelation is a late maturing variety and the opportunity for earlier drilling is important as this will bring the maturity date forward, an important benefit especially for growers in the north. Zulu has performed very well in early drilled situations on farms in the north, producing high tiller numbers with a prostrate winter habit and an earlier plant development in the spring. The variety does also have very good ear fertility. Drilling of Zulu should be targeted from mid-September onwards. Suggested drilling dates for Limagrain varieties based on regional trials data and on farm performance.